If you can’t tell from scanning through the rest of our blog, we love DIY recycling projects. When you’re the greenest material recovery facility in the NY/NJ metropolitan area, repurposing materials like peanut butter jars, toilet paper rolls, and soda cans is just something that comes naturally. When we’re lacking in inspiration though, we love to turn to the Internet to see what crafters are up to. When we saw this DIY jewelry stand made out of plastic soda bottles, we just knew we had to share it with you! We’ve seen a lot of great recycling crafts during our searches but this one is by far the most beautiful and useful idea. Jewelry is not that easy to organize and even when you have jewelry boxes they aren’t always the most attractive (or environmental friendly) holders. 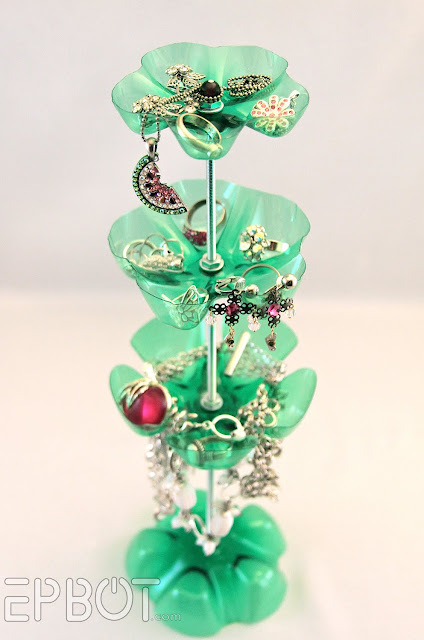 Why not make your own, aesthetically pleasing jewelry stand that repurposes the bottom of old plastic bottles? First cut the bottom of your soda bottles off as deep or as shallow as you’d like. These will serve as the holders for your jewelry on the stand, so keep in mind what jewelry you’d like to put on each bottom. Stick the rod through the holes and secure it with the nuts and washers. Don’t forget to post pictures of your completed craft on our Facebook page and keep the conversation going about recycling on Twitter using #werecycle @westsideenviro! We love the start of fall here at Westside Environmental. The kids are back in school, temperatures are starting to get cooler, football is starting up—did we mention the kids are back in school? As relaxing as your kid-free home might be, we know you secretly miss spending time with them. When we came across this fun recycled craft we knew it was perfect for an afterschool or weekend activity with your little students. 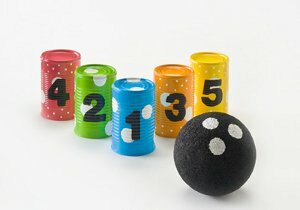 Not only is soup can bowling a craft that’s fun to make with your kids, but it’s also a game that can be played over and over again for unlimited fun! This craft is easy to make and only requires a few materials that you can find in your home. All you’ll need are soup cans, a 5″ Styrofoam ball, and some paint! The soup cans will serve as your bowling pins so while we recommend five for the size of the Styrofoam ball, you’re welcome to use as many as you wish you recycle! The more cans you use the more challenging your game will be! Clean out your soup cans and dry them so they’ll be ready to be painted! Paint your Styrofoam ball black like a bowling ball. For some added detail, add three white dots to serve as finger holes. Next, let your kids paint the soup cans however they’d like. Let them get creative! You never know what your little art students are going to come up with! Paint numbers on the front of the cans with black paint. Be sure to paint them with the bottom of the paint can facing up! All that’s left to do is to line them up and knock them down! Don’t forget to post pictures of your completed craft on our Facebook page and keep the conversation going about recycling on Twitter using #werecycle @westsideenviro! Reduce, Reuse, Recycle. We all know these three words. In fact, most of us have grown up hearing them. Why is it then, that we often focus only on “recycle”? Reduce and Reuse are just as important when it comes to going green and taking care of our environment. This post is going to focus on the second word, “reuse” and how we can reuse plastic bags without just throwing them in the recycling bin or using them again at the store. Over 1 trillion plastic bags are used every year worldwide. That means every minute, approximately 2 million plastic bags are used. Think about that… that’s a lot of plastic being used probably only one time. Below are 10 creative ways to reuse plastic bags to make our lives easier and our impact on the environment greener. Keep left over plastic bags in your glove compartment to use as trash and recycling bags on road trips. This is also helpful if you have kids and are just driving across town! When going on a trip, pack your shoes in plastic bags before you throw them in your luggage. That way, the rest of your belongings will be kept clean from any dirt or germs at the bottom of your shoes. You can also use these on trips to keep dirty clothes separated from clean ones! Have kids? You can use plastic bags as parachutes for action figures to elevate the fun at playtime. All you need are plastic bags and string (or dental floss!) Check out these directions and get crafting! If you’re moving anytime soon, save up your plastic bags and use them to pack drinking glasses, vases, and other fragile items. A layer of four bags or so around each object provides it with enough protection without the mess of newspaper ink or broken Styrofoam. In the winter you can use plastic bags to cover up your side view mirrors and windshield wipers on your car. When it gets cold or snows those parts will be frost-free! You can even use plastic bags to help you clean! Use them to dust off out-of-season shoes and anything dusty that might be forgotten in your closet. Plastic bags are soft when piled together so you can use them to stuff pet beds or throw pillows that have thick fabric covers. When it’s cold outside you can use plastic bags to protect plants from getting frost overnight. Just cover them with the plastic bags and tie the handles around the pots. Make sure you remember to take the bags off in the morning! If you’re going to be doing arts and crafts, cut slits in the sides of your plastic bags and lay them out on your crafting surface so you don’t make a mess! If all else fails or you’re just not the creative type, you can save up your plastic bags and donate them. Look for local food pantries, libraries, grocery stores, or hospitals that will take them. When’s the last time you did a craft with you child? If you can’t remember, maybe it’s time to break out the old craft supplies (and maybe even your recycling bin) and get to work! Crafts that incorporate recyclable products are a fun, creative activity that demonstrates to your children how to reuse trash for fun or purpose and expand their minds to think in new, inventive ways. It’s also a guaranteed way to turn a bored child into a happy crafter (as well as an avid recycler!) 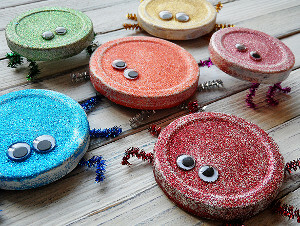 If you have elementary school aged children and some old jar lids, they’ll love creating some cute glitter bugs this summer. You’ll even love the cute creations when your kids decide to add some extra flair to your yard decorating with them! Just paint both sides of the lids white, cover them in glitter paint, and then stick eyes on top. After that you just need to glue the pipe cleaners to the bottom and viola—you’ve created your own glitter bugs! For some extra fun, make a variety of different colored and sized glitter bugs for you kids to play with. Try helping them make their favorite TV characters or super heroes like Mickey Mouse or Spiderman. They’ll love having adventures with their little glitter-bug figurines in the yard. Don’t forget to share the pictures of your completed recycled craft! * Note: since you’re only using the lids you’ll have the jars left over-don’t throw them out just yet! You might want to recycle them yourself and use them as unique vases. We found this DIY valentine’s day project, and just had to share it with you! We thought it was the perfect mix of recycling old (who doesn’t have a TON of wine corks?) and making it into a beautiful piece of art! This is such an easy project to do with your kids! In just 5 easy steps you have a beautiful piece of art that you can gift to anyone, or keep for yourselves! Trace a heart on a piece of heavy cardstock (this can be any size, just have the cardstock sized to the frame you want to put your final product into). Use a hot glue gun to glue down all the corks (tip: start with the outside and then fill it in). Paint the tops of the corks any shade(s) of red, pink, purple – or any color you desire! Let dry, then place into a frame. Give it to someone you love, or hang it up to enjoy it yourself! See a step-by-step with photos of how to create this recycled art here. Wondering about other Valentine’s Day DIY Crafts you can do with your kiddies? Check out this website for some great ideas! We’d love to hear how your crafts turned out, or if you have others to share – let us know on our Facebook account! This philosophy brings recycling into every step of the consumer system. 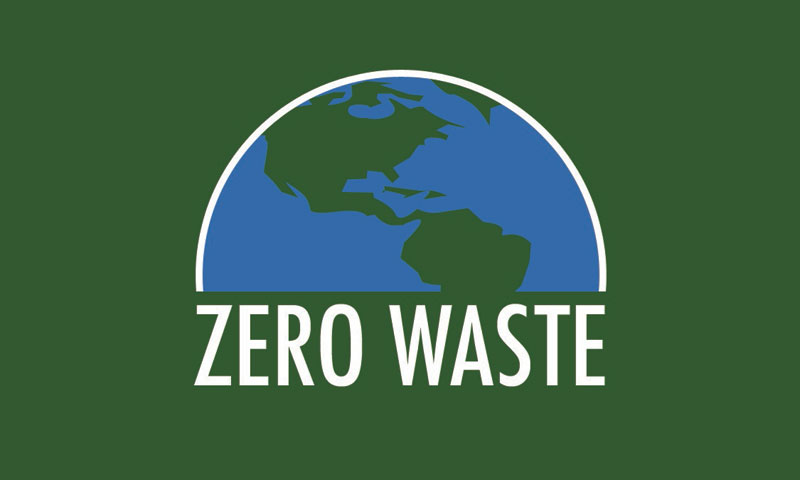 Zero Waste encourages humanity to design products and systems that use recycled materials and discourage waste. In a nutshell, all resources used to create new products should come from recycled sources, the products should also not be thrown away, they should recycled further to create new things. Basically, waste not, want not. “Zero Waste maximizes recycling, minimizes waste, reduces consumption and ensures that products are made to be reused, repaired or recycled back into nature or the marketplace.” says the Grass Roots Recycling Network. Check out more information about our recycling center and how we are trying to get New Jersey as close to Zero Waste as possible. Check us out on Twitter, Facebook, or Google+. 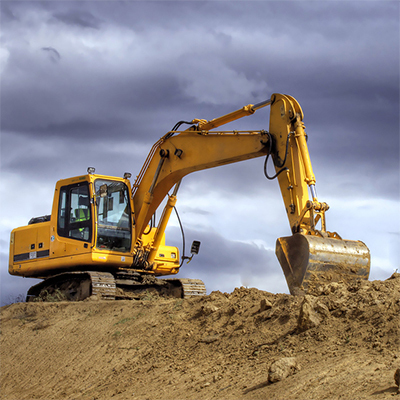 Click our logo below if you want to learn how Westside Environmental is helping New Jersey construction crews go green. Tweet us at @WestsideEnviro.